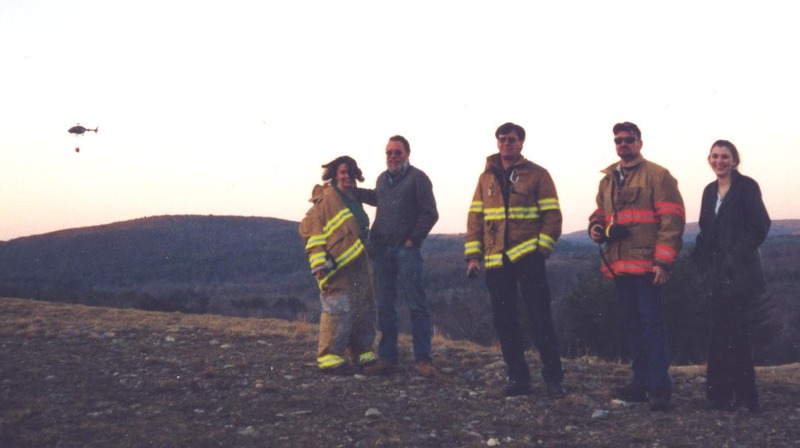 Many Barkhamsted residents saw something quite unusual on their way home from work Monday, March 24, 2003. Driving up Route 44, turning north onto Route 181, residents might have caught a glimpse of the Connecticut State Police helicopter referred to as "Trooper-1" flying overhead with a red 200-gallon bucket suspended underneath. Eleven times the helicopter flew north to the West Branch of the Farmington River, lowered down and filled the bucket with water, then rose back up and flew off to the south again. 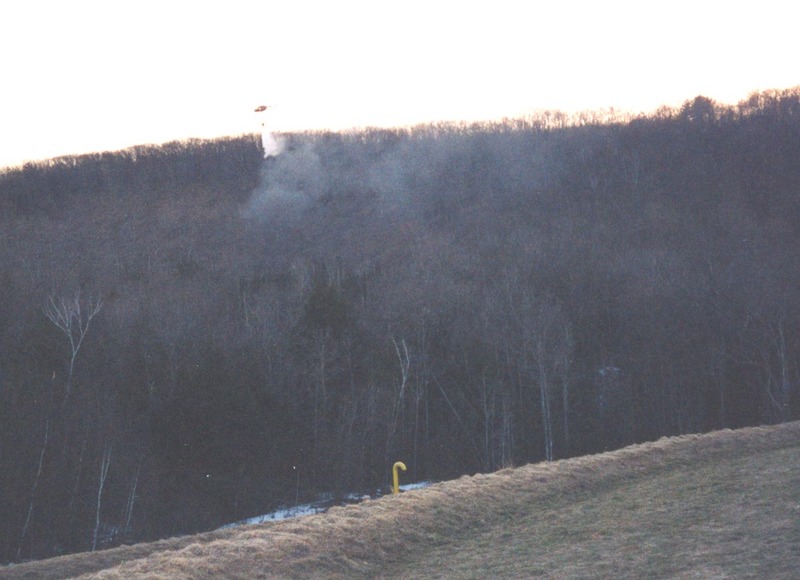 The cause of this spectacle was a fire deep in the woods, past the RRDD #1 landfill/transfer station, just over the New Hartford town line, on land purchased years ago by Barkhamsted resident Irv Hart. There, an enormous log skidder had caught fire. 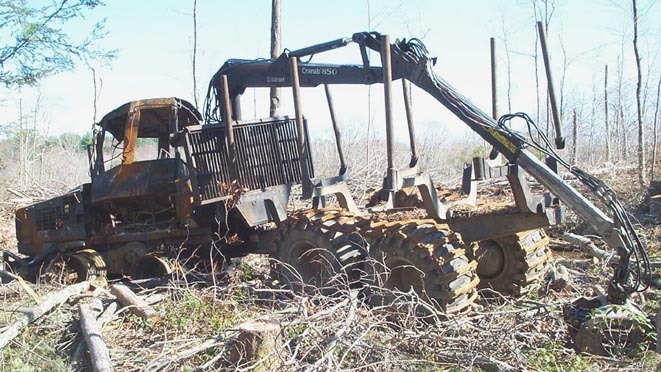 This logging forwarder, worth over $300,000, was part of a two-vehicle team logging the property that day. The second, slightly smaller vehicle, cuts the trees down, strips the branches, cuts the trunks into portable lengths, then loads them onto this enormous truck, which then hauls them out of the woods. According to Fire Marshal Richard Healy, the cause of the fire was either an extremely dry piece of wood caught up in overheated machinery or, more likely, a broken hydraulic line that allowed hydraulic fluid to come into contact with hot equipment and catch fire. Once this truck caught fire, it posed a difficult situation for firefighters. This truck had eight tires, each approximately five feet high by 18 inches wide. That much burning rubber is not easily squelched. The location of the fire posed an even more serious problem. The vehicle was located in a remote section of woods, about one-half to three-quarters of a mile from the landfill. The only access to the scene was a rough "road" created by the logging trucks. While those large vehicles were able to use this road, it was far too rough and rutted for ordinary trucks or even fire trucks to use. The early spring conditions created a quagmire of mud, which was frozen underneath, making treacherous footing for firefighters walking up steep terrain to get to the fire. On top of the mud and ice, there were branches piled and scattered throughout the area as a result of the logging process itself. The Pleasant Valley fire department first got the call around 3:30 pm, according to firefighter Marquam (Mark) Johnson. In addition to Pleasant Valley, the Riverton, Colebrook, and New Hartford fire departments also responded, and equipment was brought in from the Barkhamsted East fire department. In all, about 25-30 firefighters were on the scene, according to Riverton firefighter Norman Bird. Photo above- Riverton Firefighters Stepheni Lacasse, Todd Schroder, Marquam Johnson, Matthew Wilson, and Hilary Lovell with helicopter flying in background. About one-half to three-quarters of a mile from the landfill roads, the fire defied the traditional methods of putting it out. The fire departments were forced to try several methods until they found one that worked. First, they attempted to run hoses down from what appeared to be the nearest accessible location, a road above the blaze built to access the cell phone tower. However, the hoses were not long enough to reach the burning truck. Photo above- Pleasant Valley firefighter Mark Johnson looks on as Trooper One approaches, then drops water on the scene. When that method failed, firefighters called the Connecticut State Police to request assistance from Trooper-1. 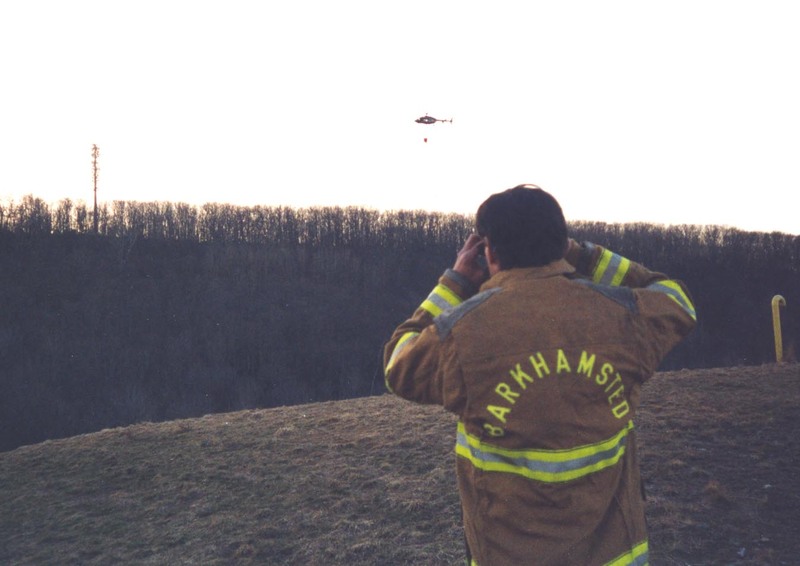 This would be the first time the helicopter and bucket method was used in the Barkhamsted area. The helicopter arrived with its "bambi" bucket adjusted to hold 150 gallons of river water and made 11 trips between the fire and the river. It filled the bucket with water just behind the first house along the river on Route 181. Firemen were stationed at the end of a nearby fishermen s access road to ensure clearance for the helicopter and keep any members of the public that might have been using the river clear and safe. The first eight buckets of water missed the fire, possibly due a lack of visibility inherent in the helicopter's design. Helicopters used out West to fight fires are specially designed, with visibility panels in the floor that enable the pilot to see directly below and aim the water drop somewhat precisely. However, the CT State Police helicopter is an ordinary passenger-type craft, with only eye-level side and front windows, making precise water drops next to impossible. And, unlike a forest fire, this vehicle fire required precision water drops. Photo above- Trooper-1 dropping water on the skidder fire. The ninth bucket load was a direct hit, but that direct hit told firefighters present that the amount of water it could drop on the fire would be nowhere near sufficient to extinguish it. So, after two more trips, the helicopter approach was also abandoned. At this point, the logging crew drove the other vehicle, the log harvester, down the "road" they had created and out of the woods. Firefighters decided they could use this vehicle to carry equipment to the site. They loaded Riverton's new portable pump and 500 feet of special forestry hose onto the harvester, and brought them to the scene. There, firefighters used shovels to build a dam in a stream of spring runoff and to dig out a make-shift pond. The portable pump was then able to draw enough water from this hastily improvise pond to finally put out the blaze. In the midst of all this hard, dangerous work, the Pleasant Valley Ladies' Auxiliary was providing some much-appreciated backup. These women cooked a pasta and bread supper for the firefighters and brought it to the scene so no one needed to go without eating while attacking this late-afternoon-into-nighttime fire. After more than five long hours, around 9:30 pm, the firefighters were finally able to trudge back through the dark, over the mud, ice, and branches to return home. Although the log fowarder was a total loss, these hardworking volunteers were able to prevent a full-scale forest fire and any additional property loss that could have resulted. Photo above- burned out logging forwarder near the RRDD#1 landfill. (this photo taken in April 2003).